The annual McCrindle concert took place at Carnegie Hall on Sunday, conducted by Joshua Gersen, with guest star Elena Urioste shining bright in Beethoven’s violin concerto, opus 61, followed by an NYYS ensemble rendition of Rimsky-Korsakov’s Scheherazade, op. 35, full of memory, passion, and promise. I couldn’t have been more delighted. There are certain moments in music from my formative years that altered the course of my cultural existence. For example, the gloomy throb of Neil Young’s acoustic guitar, recorded at a concert in Chicago circa 1970, and the vibrant electric guitars of George Barnes and Bucky Pizzarelli swinging into gear from New York’s Town Hall a year later, cemented my orientation toward those six stringed instruments. But when it comes to classical music, it was the televised performance by the Philadelphia orchestra of Scheherazade, conducted by Eugene Ormandy, and featuring the sublime artistry of concertmaster Norman Carol, which made all the difference. On that evening, I first experienced how the work of a world-class artist or ensemble of artists can rouse deep and intense emotional response, and move the human spirit in profoundly wonderful ways. I cannot but wish a similar experience on other children growing up today. I have waited a long time to witness a performance of this well-loved piece of music in person. The New York Youth Symphony and concertmaster Joseph Morag did not disappoint. Conductor Joshua Gersen saw to that. He is very good at choosing works that will provide young musicians with experience across a wide range of styles and responsibility, from stand-out solos to supporting roles in collaboration with seasoned professionals. And the achievement of such goals was displayed in the opening selection of this year’s McCrindle Concert, Beethoven’s violin concerto in D Major, featuring guest artist Elena Urioste. This particular performance of the concerto had its own childhood connection to the Philadelphia, as Ms. Urioste first appeared with that orchestra at the age of 13. 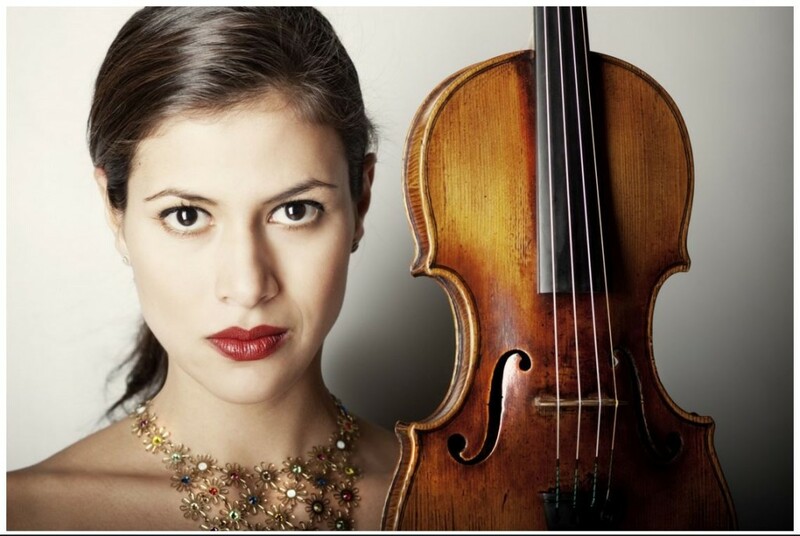 She has since performed in front of many orchestras, here and abroad, and she was recently named a BBC New Generation Artist, to go along with numerous other accolades and awards. With various melodies across three movements, crafted to suggest the French composition style popular at that time, Beethoven’s concerto was not well received when it made its own debut in 1806. He rewrote it for piano, but the violin concerto was not revived until years after his death. It has now become one of the most performed of violin concerti over the past century. Beethoven starts off the first movement with a brooding military tone of drums and woodwinds. This vanguard is followed by dramatic surges and explosions cast from the strings, culminating in a sweeping display of arms between a battery of bassists on one side and a regiment of violinists upon the other, with flanking support by a squadron of violists and cellists, which was well rendered by all the young fiddlers. And then the solo violin of Ms. Urioste arrived on high, to play over, in and around the orchestra, like a fluttering, fleeting lark invading a martial parade, at times soaring overhead, or plunging down and around the warm, woody bassoons and languid clarinets, often rising midway to draw out extended trills like the wings of a hummingbird suspended in midair. With respites provided by the glowing strings, and responsive accompaniment from the expressive woodwinds, Urioste brought a majestic panache to the melancholic gypsy-like melody of the second movement, and reveled in the jaunty alpine folk dance feel of the third movement’s main theme, so recognizable, even if many people fail to remember from whence it comes. The early eighteenth-century Neapolitan violin built by Alessandro Cagliano, now played by Ms. Urioste, was placed in very good hands. She has exquisite touch and attack, provoking reedy definition from the middle strings at will, while drawing out rounder, velvety tones from them moments later. The texture and weight of the muscled bottom string was likewise manipulated until at times it seemed two separate fiddles were exchanged as needed. And the topmost timbres were alive with character and enviable purity. I have no idea whose credenza Urioste was interpreting at the end of the first movement, but it was punctuated by dramatic double stops, with fluid runs up the neck, and heart-piercing tone in the lengthy sustain she achieved time and again in the highest notes, clear and poignant as tears in sunlight. And all of it crowned by a marvelous passage where she accompanied her own trebly melody with a sonorous counterpoint across the lower strings. It was the sort of solo one cheers at a rock concert, but civilly admires from afar at Carnegie Hall, until it is all over. At that moment, the entire house erupted to cover her in waves of applause. Elena Urioste was not the only one who incited the repeated ovations at the conclusion of the 40 minute concerto. The entire ensemble did an exemplary job, most notably the pairings of bassoons, clarinets, flutes, oboes, and the young man on the timpani whose drums at times had to dance step for step with Urioste’s agile violin. During the interval, the stage lost the featured soloist, and gained considerably more orchestra members, including a second row of bassists and the full complement of percussionists required to achieve the depth and splendor of Rimsky-Korsakov’s lavish tone poem. Scheherazade is the name of the tale-weaving wife in One Thousand and One Nights, a collection of ancient stories from India, Persia and the Islamic realms. First translated from Arabic in the early 1700s, it was the subject of much scholarship in the 1880s. Basically, its renewed popularity made it the Game of Thrones of La Belle Époque, and the composer capitalized on that in 1887, scoring what he considered a pageant of oriental fairy tales. These he presented in a suite of independent motifs interlaced with overreaching melodic themes, rather than a more structured composition like a symphony, which would have required certain constraints and conventions of the day. And it is exactly this freedom of form, with its unusual reliance on rhythm and relatively simple melodies repeated in various ways, that helped make the work one of the greatest hits of classical music ever since. The opening section establishes a bass-driven theme representing the despotic sultan whom Scheherazade must placate with nightly stories of adventure, romance, suspense and mystery. She is represented by the principal violin, through one of the most beguiling melodies in the classical canon, here beautifully rendered by Mr. Morag, and often preceded by an arresting flourish from the harp that at once evoked the image of hanging gardens nourished by the splash of fountains on quiet desert nights. The theme is taken up or commented upon by various other instruments as each movement unfolds, with different threads played out like the exotic exploits spun by the most inventive of storytellers. The principal cello, oboe, flute, horns, brass, and clarinet and their supportive second and thirds are to be congratulated. Their performance across all four movements was magnificent, at times taking on roles of individual expression, like characters in the chapters of a novel. And the abundant strings and entire brass section rose to the occasion time and again, to provide thrilling passages that swirled like windswept seas. The wide array of drummers and percussionists took their posts to became the sound effects of courtly intrigue, dashing guardsman, suspenseful chase scenes, gentle lovers, and lively dancers in joyous pageantry. And in the final movement, the whole orchestra enlivened every pulse, as the various capers and characters showed up to join in the exhilarating, climactic cavalcade, before the suddenly serene ending, where the enchanting sultana retires for the night. But before all that, there is the third movement, with its sighing romantic swells. It is one of those gently provocative musical masterpieces that can sweep away listeners to where their visual imagery becomes so vivid they almost feel like they had fallen into a waking dream – at least when an orchestra really nails it. And from the lilting heads I saw among the box seats with closed eyes and serene smiles, I can say I was not the only one thus moved by this particular rendering. And in the midst of the pastoral romance, originally subtitled ‘the Young Prince and Young Princess,’ is heard the intermezzo, where the solo violin reprises Scheherazade’s haunting theme and expands upon it. Concertmaster Morag did the piece proud and I could not have been happier for him. He has been with the New York Youth Symphony since before I began attending their concerts. This was a wonderful way to let him step into the spotlight, after years of dedication to the ensemble, and playing second fiddle, as it were, to the guest artists. It is my understanding that Mr. Morag is currently reading Physics at Columbia University, where he also takes part in the school’s music programs. I do not know how much longer he will remain with the NYYS, but I do know he has been with them since he was 12 years old, and continues to set a marvelous example for the younger members today. I will confess, when conductor Gersen gestured to Morag to take a bow at the close of the concert, and then shook his hand, I became a bit “verklempt.” For some time I was unable to add my voice to the boisterous cheering that rose from across the entire audience. Whether this young man finds his career in the arts or sciences, or elsewhere, it is hoped his talents will continue to bring pleasure to any who have the opportunity to experience his music. And the same wish is made for all the members who have put in the hours to earn a chair in the New York Youth Symphony, basically an after-school program that must fit into already very full days of some very young people. To catch sight of a young lady seemingly no taller than the instrument she wields, and then hear her as she plays it with such powerful command and nuanced facility, is simply delightful. And to marvel at the rich tone of certain instruments or the melodious ease in which they are employed, and then to see their owners out amongst friends and family after the performance, and be reminded of just how young some of them – ALL of them – really are, well, it only adds to the sense of wonder at the enormity of their musical accomplishments. And no small accomplishment is it on the part of Joshua Gersen to bring out the best of these fine young musicians. Now in his third season heading the NYYS, this has not gone unnoticed. Gersen has been appointed assistant conductor for the New York Philharmonic, beginning with their 2015-16 season. While congratulations are richly deserved, it is hoped he will remain at the front and center of the NYYS for some time to come, as his gifts include leading amazing and amazingly young musicians in making the most of their exceptional talent. He also has a gift for choosing my favorite music to perform at these concerts. I admit a weakness for the Romantics and those most influenced by them. But there is a reason some opuses become standards – they are much beloved by a wide population. Anyone taking part in this concert who might end up in a professional orchestra someday will almost certainly face these same pieces with fewer rehearsal days than they get now. This is no different than exposing Finance majors to the market-analysis software preferred in the backrooms on Wall Street. Every ticket sold or donation given to the NYYS is money very well spent. But for me, being able to hear compositions like Brahms’s 4th Symphony performed live at Carnegie Hall, followed by this year’s presentation of Beethoven’s violin concerto, with Scheherazade on the same bill, has been a cherished treat to these aging ears. I guess I could wish Gersen might include “the Ninth” one of these years, if they could manage to work the whole thing up amidst school and homework and family obligations, and find a choral group to collaborate with. Its pastoral third movement is even more entrancing than that of Scheherazade. Not that the NYYS powers that be would ever tune in to my lucky star. And then I saw just today that they are in fact granting that very wish. I have already rescheduled the vacation I had planned to include that weekend. At $20 a ticket, from the front row to the top most seat of the highest gallery, anyone should find this the best entertainment value in all of New York City. Do yourself the favor, bring the kids, bring your grandparents, bring your neighbors. Their lives, their hearts, and their souls will reap genuine enrichment as a result. And be sure to wave if you see me, as I’ll be there. Spectacular Jazz at Lincoln Center by the NYYS Jazz Orchestra, March 16, two shows! What a lovely and thoughtful review. I chanced upon it while browsing for reviews of Joseph Morag’s performance of Chausson’s Poeme with the Columbia University Orchestra at Alice Tully, and was utterly charmed. I have shared it with the NYYS. See you at the next concert!